We began our exploration of the Mughal influence on Vaisnavism in the 16th to 18th centuries by summarizing briefly the progression of Mughal invaders. Following the arrival of the Sultanate at Delhi, the first Mughal Emperor in India was Babur, who ruled briefly from 1526 to 1530 A.D. Although this marks the official start of the Mughal Empire in India, we should emphasize that this is not the start of the Islamic influence in India. A good example of an earlier appearance of the Mohammedans in India is found in Malwa. There are two areas generally referred to as Malwa. One is an ancient region stretching through parts of the Punjab and Haryana, between the Sutlej and Yamuna rivers. The Malwa Plateau region is in Madhya Pradesh, Central India, where it covers a broad area. This Malwa has a rich history of devotional arts, and the early influence of Islam can be see in Vaisnava arts of that era. The Malwa Sultanate was a late medieval independent kingdom in the Malwa region of the present day Madhya Pradesh, from 1392-1562. In 1401 A.D., -- more than 100 years before Babur arrived -- Dilwar Khan, a descendant and emissary of Mohammad Ghori, declared himself the independent ruler of the Malwa region. In 1405 his rule was usurped by Hoshang Shah, a local Khalji Muslim. Shah made Mandu his capital, and under his patronage, Indo-Islamic arts and architecture flourished and spread throughout Central India. Hoshang Shah was succeeded by another Khaliji ruler, his grandson Mahmud I. In 1540, after Sher Shah Sur defeated the Mughal emperor Humayun and captured all of his territories including Malwa and Gujarat, Shiya Khan was appointed governor of Malwa. Under his court, patronage of the arts continue. Akbar eventually defeated the local Khalji rulers, in 1562, and Malwa fell under the Mughal Empire. The earliest Islamic influence in Malwa's arts can be seen in illustrated texts from the early 15th century, such as the Kalpa Sutra and Nimat-nama (Book of Delicacies). 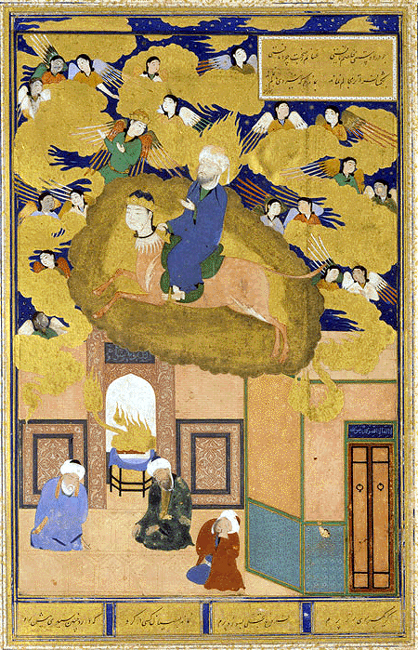 These manuscripts were illuminated following the Persian style, finely etched in ultramarine, red, and gold. This influence can be seen in various paintings of the time with Vaisnava content, particularly in border work. The Nimat-nama, a treatise on the art of cooking, was created during the time of Ghiyasaldin Khilji of Malwa (1469-1500 A.D.), and includes many portraits of the ruling Shah. 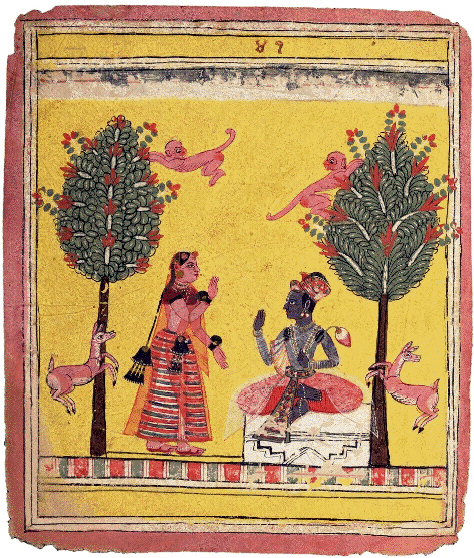 The manuscript marked the beginning of a new school of painting in Malwa. The Persian influence is seen in the flowering trees, grassy tufts, flowering plants and clouds. The convergence of the Persian style of Shiraz with the Vedic style is especially seen in female figures and costumes. Another interesting painting of the day is the above illustration from the Bustan, a manuscript executed for Sultan Nadir Shah Khilji of Malwa around 1500 A.D. One of the similarities between this painting and the illustration from the Nimat-nama, above, can be seen in the style of the faces. The figures all have very rounded faces, particularly at the chin. The progression of this style is clearly seen in later painting from Malwa like the one below, a manuscript leaf from the Rasikapriya. In this image, Radha and Krsna both have very rounded faces. 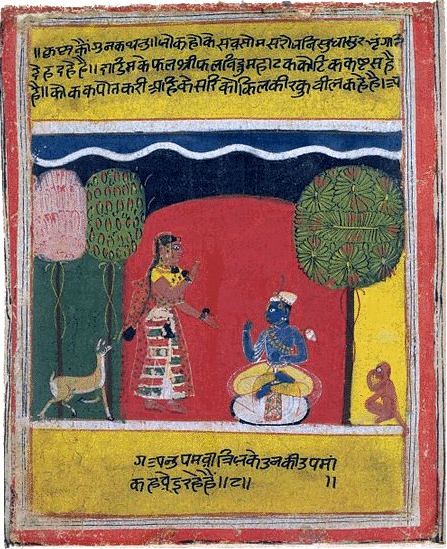 We find an interesting comparison of artistic styles in another Malwa painting from that period, shown below. Here we have a very similar composition: Sri Krsna is seated, holding a lotus, while Radha stands nearby, addressing Him. Both have one hand in mudra. The scene is framed by trees with deer and monkeys. In the image below, however, we see that the painter has stayed true to the prevailing Indian style rather than carrying forward the Persian influence, with rounded faces like those seen in the Rasikapriya illustration. It's also interesting to note the similarities between the figures in the Persian style Rasikapriya painting and the later Rajput School. In a painting shown earlier in this series, a Rajput painting represents something of a combination of these two styles, with faces that are somewhat rounded, but slightly angular. The style of painting in Malwa transformed once again in the late 16th to early 17th centuries, becoming even more fluid. The luxuriant trees with climbing creepers mirror other schools of Vaisnava painting, including the Rajput School, and clearly depart from the Mughal style.